On the campaign trail, Donald Trump often called out news organizations for what he said was irresponsible reporting and excluded some of their reporters from his rallies. After assuming office, the President and his staff have continued to limit the access of some news organizations, leading to a larger issue under the First Amendment. 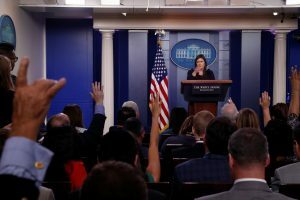 The larger question remains: Can reporters be barred from news conferences because the Trump administration objects to coverage? For news, analysis, history & legal background read on. See more on the legal battle between CNN and the White House over Acosta’s press credentials and how this case was resolved. CNN’s Chief White House Correspondent Jim Acosta often gets into tense exchanges with President Trump and his Press Secretary Sarah Huckabee Sanders. But following a post-midterm election open press conference in which President Trump shut down Acosta’s line of questioning and a White House staffer tried take away his microphone, Acosta was denied entrance to the White House and was forced to give his hard pass over to Secret Service. Sarah Huckabee Sanders shared a video of the exchange on Twitter to support her claim, but many news organizations are calling out the video for being doctored to appear more violent, the same video that was shared by Paul Joseph Watson, the editor-at-large of Infowars.com. The New York Times‘ Peter Baker says that in his more than two decades of covering the White House, he cannot recall a time when a reporter’s credentials were revoked because the White House disapproved of coverage. He suggested that Trump called on Acosta at the conference because he welcomed the confrontation. During a White House photo op with the president of the European Commission, President Trump declined to answer questions called out by network pool reporter Kaitlin Collins about the newly released tapes of his conversations with his former lawyer Michael Cohen and about Vladimir Putin turning down an invitation to the White House. Later, she was told by Press Secretary Sarah Sanders and deputy chief of staff Bill Shine that she would not be allowed to attend an open press event later in the day in the Rose Garden because they deemed her questions at the venue as “inappropriate”. CNN, other journalists at rival networks, along with the White House Correspondents’ Association, quickly backed Collins by calling out the undeserved penalty. We strongly condemn the White House’s misguided and inappropriate decision today to bar one of our members from an open press event after she asked questions they did not like. This type of retaliation is wholly inappropriate, wrong-headed, and weak. It cannot stand. Reporters asking questions of powerful government officials, up to and including the President, helps hold those people accountable. In our republic, the WHCA supports the prerogative of all reporters to do their jobs without fear of reprisal from the government. Reporters from CNN, The Associated Press, and E&E News were barred by the EPA from entering a national summit “of national priority,” while other reporters were allowed inside for Scott Pruitt’s opening remarks after having been invited by the agency the day before. Reporter Ellen Knickermeyer from The Associate Press was grabbed and pushed out of the building after she asked to speak with an EPA public relations person. An EPA official later called Knickermeyer to apologize. EPA spokesman Jahan Wilcox said that space limitations inside the venue would only allow them to accommodate 10 reporters and that there would be a livestream for those that could not attend. But The Hill reported that a handful of seats were vacant in the press section by the time Pruitt began speaking. Another reporter told Politico there were dozens of available seats in the room. The EPA later announced that reporters would be allowed to attend the afternoon sessions of the summit. News organizations responded with indignation. “While several news organizations were permitted, the EPA selectively excluded CNN and other media outlets. We understand the importance of an open and free press and we hope the EPA does, too,” a CNN spokesperson said in a statement. 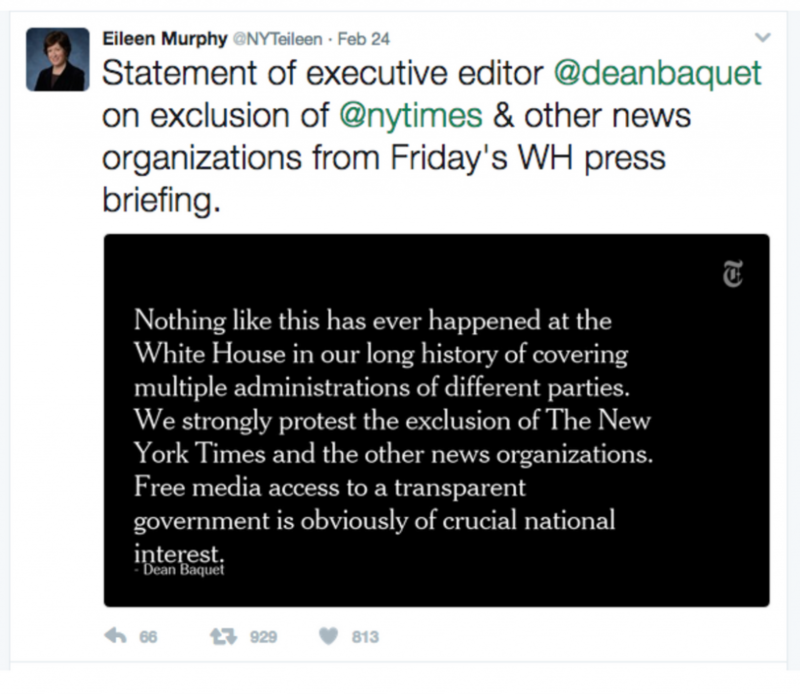 February 24, 2017: Dean Baquet, executive editor of The New York Times, protests the exclusion of the Times from a White House briefing earlier that day. Trump campaign officials denied a reporter from Buzzfeed access to an event in Newton, IA. He was also not allowed to enter as a member of the general public. A Washington Post reporter was denied press credentials to enter a Trump event in Milwaukee. At the time, a six-week old ban on Washington Post reporters covering Trump rallies was in effect. The reporter entered the event with the general public, but when confronted by private security and local police, he was prohibited from attending. Daily Beast reporters were rejected in November 2015 from Trump events in response to an editor endorsing a boycott of Trump businesses. The exclusion continued into 2016. Trump staffers and a police officer ejected a New York Times reporter from a primary campaign event at a pizza restaurant in Waukee, Iowa. After Trump sues Univision for backing out of covering the Miss Universe contest, Trump denies access to its reporters at campaign events. Corey Lewandowski, the national campaign manager, told a Register reporter that she would not be granted access for an upcoming event in Iowa. He said the decision was “based on the editorial that they wrote earlier in the week,” which urged Trump to exit the primary campaign. November 8, 2018: Could Acosta’s Suspension Trigger A Walkout? Rick Noack writes in The Washington Post points to a reporter boycott of a news conference in Germany as a result of one reporter being excluded, and wonders if US reporters will do the same. Frank LoMonte, Director of the Brechner Center for Freedom of Information at the University of Florida asks in the case of Kaitlin Collins: “Does CNN’s White House correspondent, or any journalist, have a First Amendment ‘right’ to a press pass or a spot at a news conference?” He clarifies the First Amendment issues, or lack therof, of banning reporters from newsgathering activities and government retaliation. These cases involve access for journalists to official actions of public officials, not to campaign events such as held by a public figure such as Donald Trump before he became President. Jason Nicholas, a photojournalist, argued that his First Amendment rights were denied by the New York Police Department, which he said revoked his press credentials because it disagreed with the content of his work. Richard Borreca, a reporter for the Honolulu Star-Bulletin, was denied access to news conferences held by Mayor Frank Fasi of Honolulu in his office. The mayor, according to the court, “concluded that Borreca was irresponsible, inaccurate, biased, and malicious in reporting on the mayor and the city administration.” The court issued a preliminary injunction to prevent the reporter’s exclusion.